Avoiding fatty, sodium-laden foods is difficult enough in your day-to-day life, let alone on Super Bowl Sunday, when you’re literally surrounded by the stuff. And it’s safe to say that the guy educating his friends on the caloric properties of a chicken wing between downs isn’t going to be the most popular person in the room. Thankfully, that won’t be you if you follow these suggestions. Unless it puts your friendships in jeopardy, go for veggie instead of pepperoni. Otherwise, dab the slices with a paper towel and steer clear of the crust. Forgo regular fried potato chips for Baked Sun Chips or Kettle Bakes. 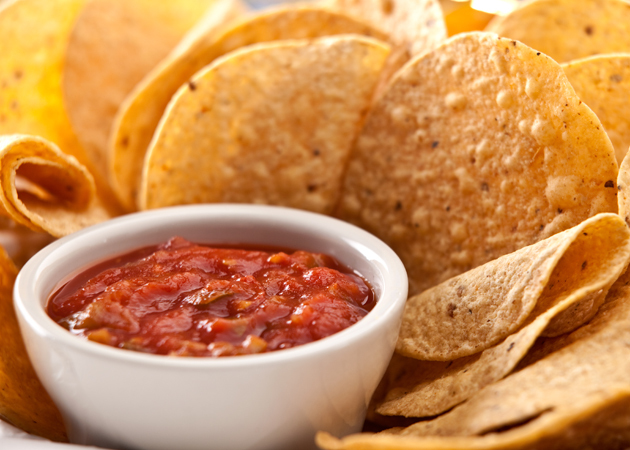 The latter contain 65% less fat than regular chips, with 0.5g of saturated fat and zero cholesterol per serving. Pick from the bottom of the pile to limit cheese, and make sure to get a couple jalapeños, which contain fat-burning capsaicin. Dip into guacamole, not sour cream. Eat as many as possible. Because of their low energy density (calories per gram), vegetables will fill you up on fewer calories while delivering healthy vitamins and minerals. Guinness Draught, Sam Adams Light, and Corona Light all come in at less than 130 calories, with fewer than 10g of carbs. If you’re really going for volume, stick with Bud Select 55, MGD, or Busch Light. Opt for diet or “zero” versions if you must, but you’re not doing yourself any favors. If you’re downing soda for the sake of drinking something that’s not beer, opt instead for natural ice tea, which contains cell-protecting free radicals. The problem with mozzarella sticks is that they’re absolutely loaded with calories but take only half a second to eat. We prefer string cheese, which delivers similar flavor and feels like more food—and most are 100 calories or less. Whether it’s a platter or a six-foot sub, choose whole-wheat bread, opt for a lean meat like chicken or turkey, swap the mayo for oil, go nuts with vegetables, and double up on meat to add extra protein. Here’s a tip for eating half as much dip as you normally would without even realizing it: Instead of dipping a single chip, put two together and dip them. When you separate them, only one side of each will be dipped. What’s America Eating on Super Bowl Sunday? This data from Seamless reveals where major cities stand on the two most popular food orders. San Francisco: 28% pizza, 9% wings. Chicago: 18% pizza, 17% wings. Washington, DC: 29% pizza, 14% wings. Boston: 44% pizza, 18% wings. New York: 14% pizza, 13% wings. Philadelphia: 26% pizza, 38% wings. Los Angeles: 14% pizza, 9% wings.